What is COOL TECH Fat Freeze? Fat Freezing is an exciting new non-invasive method of body sculpting available in our Perth clinic that removes unwanted stubborn bulges to achieve a slimmer, more toned and contoured figure. How does the COOL TECH Fat Freeze Procedure Work? Based on the principle of Cryolipolysis, COOL TECH Fat Freeze utilises a controlled cooling system to selectively freeze fat cells, which are capable of being destroyed at low temperatures without damage to surrounding skin tissue and blood vessels. Once frozen, the dead fat cells are flushed out of the body naturally over a number of months. Following selective exposure to cooling, the fat cells undergo a natural process of cell elimination. The body’s normal metabolic processes gradually remove the fat cells in the treated area, a process similar to the elimination of fat from digested food. The COOL TECH Fat Freeze treatment is ideal for those at a stable weight with small to moderate areas of stubborn fat resistant to diet and exercise. The procedure also offers a quick, effective and affordable treatment option with minimal associated discomfort and downtime for those seeking non-invasive alternatives to surgery. 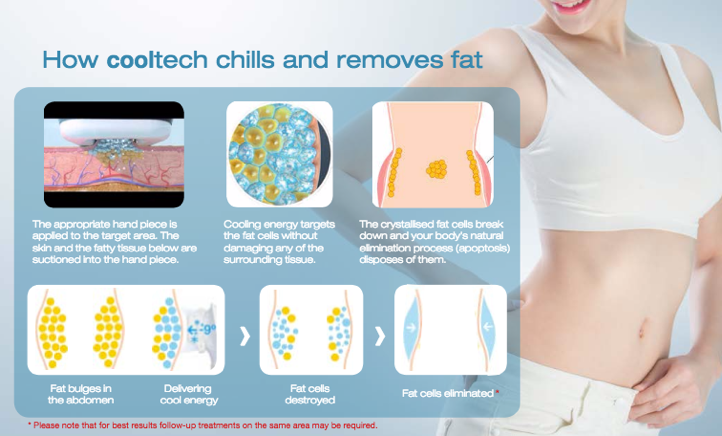 Which Areas Can be Treated by COOL TECH Fat Freeze? The COOL TECH Fat Freeze procedure may improve the appearance of stubborn fatty deposits on the stomach, love handles, back, thighs and arms. How is the COOL TECH Fat Freeze Procedure Performed? Unlike traditional surgical procedures, the COOL TECH Fat Freeze procedure is a non-invasive, no needle procedure which requires no sedation or anaesthesia. During the treatment, a non-invasive applicator is applied to the skin’s surface to deliver precisely controlled cooling to selectively target and eliminate the fat cells in the area. Once in position, the cooling applicator remains on the skin for a period of approximately one hour per treated area. During this time you will be able sit or lie comfortably and read, work on your laptop, listen to your iPod or watch a DVD. Immediately after the procedure the treated area may appear slightly red and feel cool or numb to touch. Some slight, temporary bruising may also be present, however this should subside over the subsequent days. Following the procedure, most patients typically resume their normal routine and activities and are able to return to work and exercise that same day. Visible results may be seen over a period of two to four months following treatment and may be enhanced with subsequent follow up treatment. Fat cells, when exposed to controlled cooling, undergo a process of crystallisation and eventual destruction which results in a gradual reduction in thickness of the fatty layer. The body’s normal metabolic process gradually removes the fat cells in the treated area – a process similar to the elimination of fat from digested food.